We should, hopefully, be past the technical hitches and Discworld Monthly should have fully moved over to our new super-duper server. In the process we have upgraded to using a SSL certificate which means communications between you and our server is more secure. We've also worked on the various background technologies (with strange acronyms) which should mean our newsletter is less likely to upset your spam filters (no promises but we've done what we can) . So with a bit of luck this should be the first of many newsletter issues sent from our new home. While this is definitely the way forward it does mean we need to push our merchandise a little because our server costs (excluding domain names) have risen from 6GBP a month to 24GBP a month. After what seems like decades (but probably isn't) in production hell I am so excited about the recent press release about The Watch TV series which has been greenlit by BBC America (see section 2 of this issue) . We know it's still early days but we are so pleased that its moved forward enough for an official press release to be announced. I remember Terry talking about this back at the 2012 Convention (or possibly even earlier) . With Good Omens coming next year and The Watch some time in the future it appears that Terry still has a few surprises waiting for us. I just really wish that Terry could have been here to watch them with us. A few weeks back when we ran the charity auction at the Terry Pratchett Celebration evening in Beaconsfield we sold a then pre-release copy of the new hardback of the Illustrated Truckers with illustrations by Mark Beech. On the day of release we attempted to support our local bookshop by purchasing a copy for us to keep and review for the newsletter. We went to Waterstones and WHSmiths in Cardiff (yep, capital city stores) only to find that a) they didn't have any and b) they didn't have any plans to stock it. We've since also tried Swansea's WHSmiths and Waterstones (again, city store) and neither knew about the book or had ever had any copies. Is it too late for the high street bookstore. Have the on-line alternatives killed them off and they just don't know it yet? It's a sad day when a new Terry Pratchett book is released and the biggest bookstore chain in the country don't bother to order any copies for the shelves. [UPDATE] A week later we were able to get a copy in Reading Waterstones ... but we still are unable to find the new Joe McLaren covers of Unseen Academicals and Making Money. So we'll be spending our money at the Discworld Emporium at the end of the month instead. Back in August we visited Peculiar Productions' production of The Truth, which we really enjoyed. They recently wrote back to tell us that the production raised an amazing 5,000 GBP which they donated to Mind Cardiff. 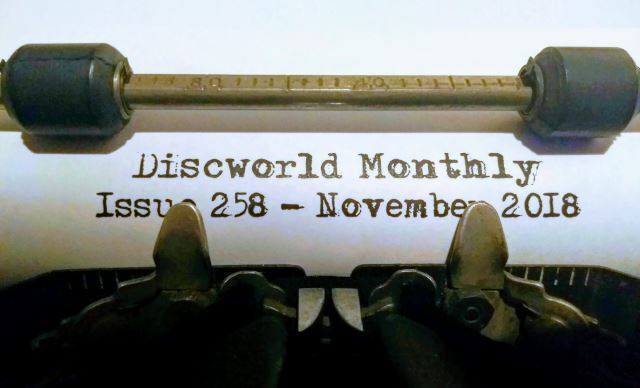 The deadline for submissions to issue 259 of Discworld Monthly is Tuesday 20th November 2018. If you are a Hogfather fan, there is a wonderful Mug with a very familiar looking Hogfather upon it. So get all your Hogswatch shopping sewn up with Discworld Monthly Merchandise and remember if you buy from us, you know one of us will dance a little jig when your order comes through! 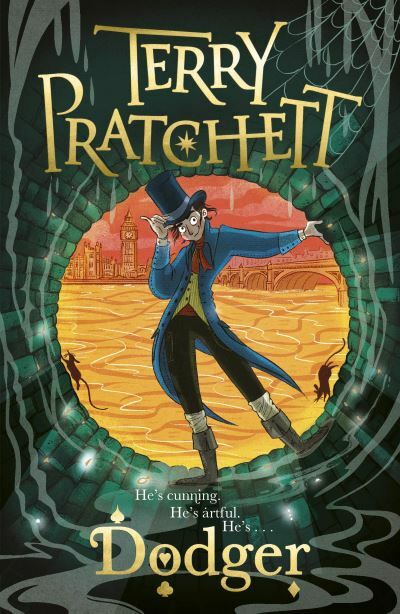 New York – October 30, 2018 – On the heels of hit series Killing Eve and the introduction of the first female Doctor on Doctor Who, BBC AMERICA announced today the greenlight of the new original scripted series, The Watch, based on Sir Terry Pratchett's wildly popular "Discworld" novels, which have sold more than 90 million books worldwide. The (8 x 60) series is produced by BBC Studios for BBC AMERICA. The Watch is distributed by BBC Studios. The Watch is a punk rock thriller inspired by the legendary 'City Watch' subset of "Discworld" novels. This disruptive, character-driven thriller centers on Terry Pratchett's misfit cops as they fight to save a ramshackle city of normalized wrongness, from both the past and future in a perilous quest. Modern and inclusive, The Watch features many famous "Discworld" creations including City Watch Captain Sam Vimes, the last scion of nobility Lady Sybil Ramkin, the naive but heroic Carrot, the mysterious Angua and the ingenious non-binary forensics expert Cheery together with Terry Pratchett's iconic characterization of Death. The Watch was commissioned for BBC AMERICA by President and GM Sarah Barnett, and Nena Rodrigue, EVP of Original Programming, Acquisitions and Production. Co-produced with Narrativia and written by Simon Allen (The Musketeers, Das Boot and New Tricks) , The Watch is executive produced by Hilary Salmon (Luther, Silent Witness and Three Girls) , Ben Donald for BBC Studios and Rob Wilkins for Narrativia. Phil Collinson (Doctor Who) also joins the team as executive producer. "The Watch has been startlingly reimagined for television by writer Simon Allen, while still cleaving to the humor, heart and ingenuity of Terry Pratchett's incomparably original work," commented BBC AMERICA President, Sarah Barnett. "BBC AMERICA embraces what's fresh and exhilarating in TV; we believe The Watch will astonish audiences." Writer Simon Allen said: "With events in our own world making the insanity of 'Discworld' seem outrageously familiar, there couldn't be a better time to bring Terry's fun, fire and fury back to the small screen or a better place than BBC AMERICA. I'm grateful to them, BBC Studios and especially Rob Wilkins at Narrativia who has been a constant source of inspiration on this epic and emotional journey." Hilary Salmon, Executive Producer and Head of BBC Studios Drama Production London, said: "The Watch is a distinctly British but defiantly global exhilarating, thriller that is disruptive in its approach to the fantasy genre and also big on the themes of mortality, inclusion, alternative facts and justice. It's a dizzying riot of hope, joy, suspense and audaciously dark humor. We can't wait to work with BBC AMERICA to bring it all to life for existing fans and brand new audiences." Rob Wilkins, Executive Producer and Managing Director of Narrativia, said: "Many years ago Terry made the brave decision to allow brand new Watch stories to be told with his existing characters. It's taken a long time for anything to happen because we guard these characters with our very lives! So many of Terry's biggest ideas seem more vital and urgent now than ever before and I am thrilled to be working with Simon and such a talented team, who understand the unique genius of their creator. They have really keyed into the subversive qualities of Terry's voice and they clearly adore 'Discworld' as much as I and millions of fans around the world do." The new series joins an outstanding offering of original scripted programming at BBC AMERICA including the Emmy-nominated Killing Eve starring Sandra Oh and Jodie Comer, the iconic series Doctor Who starring Jodie Whittaker, and the Golden Globe-winning Luther starring Idris Elba. You all know I love a good book release rumour. Well this month I have a confirmation of one rumour and rumblings of three more on the horizon. A while back I seeded the idea that Laura Ellen Anderson would be doing more of Terry's book covers for the younger generation. The one book in particular I was looking at was Dodger and earlier this month, this popped up onto various online stores. And the UK pre-order link is already live with a release date of 25th April 2019. Not so much of a rumour but still not confirmed until we see the cover, Laura has also been named as the cover artist of Nation which will be due out in July 2019. Now let's talk about the big elephant in the room. The Discworld Collector's Library Editions. This month saw the release of Thud!, Making Money and Unseen Academicals which means they have skipped a few in the Discworld Series of books. Namely The Amazing Maurice and His Educated Rodents, The Wee Free Men, A Hat Full of Sky and Wintersmith. Those in the know will appreciate that those titles are not published by the same publisher as the rest of the second half of the series, but are in fact published by Doubleday (an imprint of Random House Children) instead of Doubleday (an Imprint of Transworld) . It's a small internal matter as they all come from under the same parent company. Does the release of the Gift Editions of the Tiffany series and the Laura Ellen Anderson covers of TAMAHER and the Tiffany series does that mean we won't get Joe McLaren hardbacks like the rest of the series? So far we have received no confirmation by anyone that we will indeed get TAMAHER and the Tiffany books, so have lots of us spent out hundreds of pounds on an incomplete set? It would be a real shame not to get a complete and final set. Only time will tell and as it stands that means waiting until 2020 to find out..
Paul will be signing at Fordingbridge Library on the evening of the town's annual Christmas Lights Switch On. Copies of the new publication Terry Pratchett HisWorld, the Complete Exhibition Companion will be available, along with other publications and a selection of Discworld & Charmed Realm prints and cards. ↑≡2.5 Troll Bridge - IT'S STILL FINISHED !!! This will stay here as a reminder to all [But mainly us - Rachel] that it will be hitting the festival circuit soon. This is 225 pages of awesome fabulousness! Containing the wonderful illustrations of Discworld by Paul Kidby plus many other photos and illustrations it is 11 chapters written in conjunction with 11 people who knew or worked with Terry. These people include Colin Smith, Bernard Pearson, Rob Wilkins and Stephen Briggs. The introduction is written by Richard Henry who is the person who came up with the idea of the His World at Salisbury Museum. The first Chapter mostly uses Terry's words and the Book ends with a Chapter on Legacy which begins with a piece by Rhianna Pratchett. Nearly each page has an illustration or photograph relating to Terry or Discworld. There is a chapter based round Josh Kirby's artwork for the book covers. There are pictures of Terry, the exhibits from the His World exhibition and a fold out page. This has a copy of the Discworld Massif and with it a key to the characters in it including a seperate key for the Nac Mac Feegles - quite handy if, like me you have a print of the Massif - mine hangs above my bed and occasionally I forget who is who! At the beginning of the book there are three double pages setting out a timeline of Terry's 'Notable Life and Career Events beginning in 1948 and ending in 2015. At the end of the book there is a Legacy Timeline from 2015 to date with the last entry on it stating 'the future is an open book……'. Terry's legacy is here to stay and will carry one. This is the sort of book you can dip into randomly, I just love opening it when I have five minutes spare and looking at all the illustrations. It's also quite good for inspiration for costumes for Conventions and such like. It is a great accompaniment to the His World Exhibition but you don't have to have gone to the Exhibition to own/read this book - it is a book that every Discworld fan needs to have in their collection. Full of beautiful pictures and illustrations. It is a book that brings us fully up today with pictures of the Shed of Doom at Chalke Valley History Festival earlier this year and in the Legacy Chapter there is a short piece written by Simon Allen, who if you read the release from Narrativia at the end of October is the person is involved with writing the scripts for the new Watch Series. So, if you've not already got this book - why not?!? Go visit the Discworld Emporium Site or Discworld.com where Uncle Bernard or Mr Kidby will be happy to relieve you of your hard earned pennies in return for this 225 pages of awesomeness. GO ON! Get one today. You really do need a copy! I'm sure that elsewhere in this edition of Discworld Monthly our wonderful editors will have put the links for you to follow to get to the right place to purchase. Which in my mind describes Sir Terry Pratchett spot on, for me as least the discovery of Discworld has made the Round World a far better place than before that discovery. The book costs 30GBP for the Standard edition (Plus P&P) and 75GBP for the Slipcase Edition (plus P&P) . We'll include our own review and comparison of the two versions next month. The Brisbane Art Theatre, Queensland Australia. The Arts theatre puts on a yearly production of a STP novel each year and this year it was Men at Arms. It is a small theatre and does not have lavish sets or costumes but it is a talented crew with a passion to bring laughs and endear many theatre goers. The set was backed with a great display of guild chimneys which are great details for lovers of the Discworld. There are several regular players and two of my favourite are Vetinari and Nobby Nobbs. The theatrical skills of these two actors are great and your eyes are drawn to them and their wonderful portrayal of their characters. It is a great delight to watch Nobby embellish himself on a room and forever playing around with his endless dog-end. The movement of the story is well handled with the storyline created and the actors clearly enjoy the story and their representation of their characters. With clever lighting the transition between characters and plot lines is handled well and cut down on characters exiting and entering the stage but rather remaining on stage unlit. A lot of the actors actually look like pretty good representations of characters imagined. The humor, which is a big part of STP's writing, is well handled in the production and the laughs come thick and fast throughout the performance. The theatre has for twenty years put on a STP discworld production and this is was my fifth year and I have grown to love the intimacy of the theatre, the professionalism of the cast and the joy of seeing the Discworld on stage. On Saturday 13th October we visited The National Film and Television School in Beaconsfield for an evening of celebrating Terry Pratchett. This was the conclusion of three events that week that included a talk by Stephen Briggs at the Beaconsfield library and a Quiz night on the previous Saturday. The event started with a free drink in the foyer before we were lead into the very nice auditorium. We were treated to video messages from Rob Wilkins and Neil Gaiman who were in LA (working on Good Omens) and a second message also from Rob talking about Terry's love of Beaconsfield (where he grew up and would often claim got his education from the library) . We were then shown the first half of the documentary Terry Pratchett: Living with Alzheimer's. It's been a few years since I'd seen the documentary and it was very hard to watch. The juxtaposition of the optimism shown by Terry and those around him with the knowledge of hindsight made it a particularly hard program to watch. At the intermission we were provided with a very delightful buffet while we discussed what the documentary meant to us. After a short break we were invited to return to the auditorium where Benard Pearson (of the Cunning Artificer fame) gave a talk about his relationship with Terry - Bernard roped Pat Harkin into the conversation to talk about what a privilege it was to have Terry phone up and ask technical questions that would somehow later make it into the next book. After the very entertaining talk, the evening concluded with a charity auction. The lovely people at the Pratchett estate had donated a number of special items and we were very happy to raise with the support of the audience, just over 1,200 GBP for Alzheimer's' Research. We had a really fun evening and would happily do it again. A huge thank you to Liz Stevens who organised the event. If you went along to the evening hoping for scholarly or expert discussion on Sir Terry's works, you'd probably be disappointed. This event was an eclectic, and, to be honest, at times, baffling, mix of sessions by different university departments focusing on Sir Terry himself, but, more particularly on the research possibilities opened up by the recent cataloguing of the unique collection of his works held by TCD in the Long Room – apparently one of Sir Terry's favourite places when he was an adjunct Professor of English at TCD back in 2010. As one of the five UK legal deposit libraries, Trinity College Dublin is entitled to receive a copy of every book published in the UK. Also, in 2009, the university's collection of Sir Terry's works was augmented when Colin Smythe, his literary agent and an alumnus of TCD, donated a complete back-catalogue of translated publications to the college – a donation which continues to this day. It has taken years to catalogue the collection, but the work is now up-to-date, and the university is celebrating. The evening kicked off with the Digital Humanities department who did their thing by stuffing the entire English-language catalogue into a computer, jiggling it all about and asking the computer to spew forth in a burst of word clouds. Which it did. Now, as someone who viewed critical analysis in the same vein as vivisection when I was at university, this digitised version – even if word clouds are pretty – was still anathema to me and deep inside I could feel the build-up of a dark word cloud of my own – 'But why??' Yes, I know it's all in the name of research and linguistic analysis, but my question still remains. Because I like the words just fine in the proper order Sir Terry gave them. That said, you couldn't fault the department's enthusiasm and passion for their work. As well as word clouds of words which were unique to each book and word clouds of words which are common to all books, they had also taught the computer to understand the text rather than just recognise it so that it could throw up more meaningful data. If you think that's easy, try explaining to a computer how to deal with a cat named You for a start! That I liked. But the really cool results – evidenced by the oohs and aahs from the assembled onlookers – were the interactive maps and graphs which can be created for research purposes. These included such goodies as graphs showing the correlation between characters in one book or the relationships between all the characters in all the books or map graphs plotting the Wyrd Sisters' journey from Lancre to Genua in Witches Abroad. In the end, even I was grudgingly prepared to acknowledge that computer stuffing might actually be worthwhile. Next up was Jane Suzanne Carrol of Trinity's School of English (Children's Literature) who talked about Sir Terry's books for children. So are boys sticky nosefuls of bogeys and girls great big feisty bottomless ears? Well, they don't come much feistier than Tiffany Aching – who was, in Sir Terry's own words, 'very close to my heart'. Tiffany was the focus of the big question of the session: what is the difference between the children's books and the other Discworld books? Is it the more realistic child-centred landscape which bears a resemblance to the landscape in Sir Terry's own childhood? Or the questioning about 'who is me' that doesn't feature as much in the more grown-up novels? I'm not sure a consensus was reached, but it was an interesting journey nonetheless. Librarian John McManus headed up his section 'Wrestling with the Orangutan' as he explained how he went about cataloguing over 2,000+ items in the TCD collection, including books, games, videos and audio cassettes. The Colin Smythe donation of translated texts proved challenging, with a lot of effort going into tracking down editors, translators and illustrators in over 35 languages – more than originally anticipated. There are editions in Moldovian, Georgian, Ukranian, Polish, Japanese, and Welsh and the language with the most published editions other than English is German. Unfortunately, given the location, there was one glaring omission in the translation list – Irish! So, if anyone fancies a go at translating as Gaeilge, there's a gap in the market. Exploring the translated collection further, James Hadley of the Trinity Centre for Literary and Cultural Translation talked about his initial research carried out on a small, random selection of languages for this event. Serious questions were asked. Such as how you translate the Britishness of the novels? Or the puns and jokes? And the results were surprising. It's not unusual for literary translations to veer away from word-for-word translation – to capture the spirit rather than the letter of the original. But in the samples examined, it was clear that most of the Discworld translations stuck pretty close to the original – they didn't shy away or alter that Britishness and the humour carried over into translation, even if all the puns didn't quite make it. There was a particularly fascinating discussion about Death – the character (who is clearly male) and the word (which is not always male – think 'la mort' in French) . So what does a translator do about Death when 'death' is female? There wasn't a clear answer to this question – not enough data to work from at this point in time – although from some of the comments from audience members who had read Sir Terry in translation, it seems the juxtaposition between the gendered word and the character only adds to the overall humour. And it all proved that the collection is ripe for further research into the full body of translated texts. A dream job for an Unseen Academical with a penchant for literary translation, perhaps? As part of this eclectic celebration of Sir Terry's work, amongst all the academic shenanigans, it was more than fitting on World Alzheimer's Day to also mark his contribution to the fight against the 'embuggerance'. And some of the most moving words of the evening came from Sir Terry himself - Sabina Brennan of the Institute of Neuroscience (Brain Health) read out the entire text of his account of his disease first published by the Alzheimer's Society in 2008. Ten years on, it is still a powerful testament and manifesto against a nasty, ugly disease which robbed a brilliant man – and continues to rob so many others - of so much. But Sir Terry's crusade was not in vain. As Helen Rochford Brennan, a fellow Alzheimer's sufferer – or as Sir Terry put it: '… a person who is thoroughly annoyed with the fact they have dementia' – testified. It was moving to hear Helen recall how in 2012, she watched an interview with Sir Terry on Irish television's major chat show, The Late Late Show, when she herself was in the throes of dealing with an early onset Alzheimer's diagnosis and how that interview inspired her to reclaim her life after diagnosis. Helen is now the Chair of the European Working Group of People with Dementia and Board member to Alzheimer Europe. She is living proof that it is possible to live well with dementia and a fitting tribute to Sir Terry who did so much to prove that having Alzheimer's does not mean you have to become your own disease. This month Rachel let me set the DiscTrivia questions... So good luck! Q1. UNDEAD, YES - UNPERSON, NO is the motto of which group? Q2. What musical instrument does Sally von Humpeding play? Q3. What does Big Dave from the Pin Exchange have tattooed on his bicep? Q4. Who is the leader of the Dog Guild? Q5. What is the name of Lancre's Royal Beekeeper? This month the lovely team at Discworld.com have given us a standard edition of Terry Pratchett: HisWorld - Official Exhibition Companion and a couple of sheets of Hogswatch wrapping paper to give away. Q1. The slipcase edition of HisWord - Official Exhibition Companion is a limited to how many copies? Send you answer along with your postal address to by Tuesday 20th November. Visit Discworld.com for more information about their amazing Discworld products. Happy November Birthday greetings to: Lizzie Glaiser, Michaela Lilla Bos, Sarah Spall, Pete Smith, Steve Durbin, Danielle Clarke, Karen Carr, John Hird, Ruechenda Herd, Charlie Mitchell, Tim Van Holder, Annette Kupke, Martin Macey, Graham Stribley, Rob West, Joe Angel, Barbara Durbin, Nicola Atkin. We assume any correspondence is eligible for use in the newsletter unless otherwise stated, including the sender's email address. We may edit your letters while desperately looking for new Terry Pratchett books in bookstores. I'm so excited at the prospect of watching the Watch! I'd love to see Andy Hamilton play Nobby Nobbs (listen to him play Sergeant McGurk in the BBC radio comedy Revolting People - McGurk and Nobby must be cousins, though of course there'd be no way to confirm that lineage) . Who do we have to petition to get this casting? Anyone have Vetinari's c-mail address? In response to Noel Wray's email in issue #257, regarding the Troll Bridge project being too little, too late, for too much. I would wholehearted like to agree with you. As the director of Troll Bridge I am disappointed and disheartened by our own price point, and the only justification I can vaguely mumble is that when we commenced this journey… the world was in a very different shape. Physical media was king, duplication costs were high, and crowdfunded films were expected to mark up their costs in the absence of a distributor to look after them. Fifteen years on and we now have sites and automation allowing the crowdfunding community to spend more time creating instead of looking after pledge delivery. This puts us in a precarious situation, as we can't lower our prices now without also refunding the difference for fifteen years' worth of backer build up. It wouldn't be right for our elder supporters, for whom the film truly is late – we need to look after these backers first and foremost. Less in our favour, there also wasn't an easy way of working out shipping costs back in 2003, so everything was priced at a point that included delivery and we would wear whatever that outcome eventuated into. We are still honouring this – there are no additional shipping costs, the final price is just that; final. Prices are in US dollars, as the closest thing we have to a universal currency. If you want my opinion (and I reluctantly give this given our outstanding debt) , but you should hold onto your cash and instead see the film at your local film festival. This way you can pay a fraction of the cost on a ticket, support your local art community, and see the film as we intended it: on the big screen with an impressive sound system. It's what we designed it for. " In the October 2018 issue, reader Noel Wray voiced his concerns over the price of the Troll Bridge DVD, 50 USD from the official website, closing with "Too Little! Too Late! For Too Much!!!" Unfortunately, Noel seems to have misunderstood what that 50 USD was for. It was not a simple price to purchase the DVD (it is not on sale, not even pre-order yet) , but that in supporting the project by giving the team a pledge of 50 USD the supporter will receive a "free" copy of the DVD on release. Different pledge amounts offer different Troll Bridge pledge materials. In my case; no way would I pay 85 USD for the film on Blu-ray! But I was willing to (and did) pledge that 85 USD dollars to help support the creation of the film, and receive the Blu-Ray as a "thank you". As is not just buying a copy of the film, but doing my part to see it even being made! I have no idea what the film will cost on standard release. The Snowgun Films team probably aren't sure of that yet. Jason replies: The film will never get a "standard" release as such. As I understand it you will either be able to watch it on disc because you backed the project or hopefully at a local film festival (or possibly at future Discworld Conventions) . I hope you won't mind me responding to your "Letter to Terry" (in DWM) in public. First - you may indeed be dyslexic, but you hide it well. I had no problems following your prose. In fact the odd glitch and missing word merely reminded me of the good old Manchester Guardian of about 1957, in its heyday as the Gruniad. Second - I hope it goes viral, or similar, among youngsters who have trouble reading or writing. Your story could well be an example and inspiration to them. Thank you for sharing it with us. Hi - reading Joe's letter to Terry, I purposefully haven't read I Shall Wear Midnight yet either - I wonder is this common? Jason replies: I assume you mean The Shepherd's Crown. In which case it really isn't that unusual at all. I know many fans that feel that reading The Shepherd's will mean things have come to an end and would rather they didn't. It really is a shame not to read it though, Terry wanted people to read his work and would be disappointed if his final work became a museum piece rather than one last chance to cherish his words. As someone that has read it (more than once) I have to say it is a hugely emotional and deeply personal book and while maybe not as polished as it might have been still a worthy read. PS. If you genuinely mean "I Shall Wear Midnight" then yes I suspect that it rather uncommon. A TV-Tie in version of the actual book Good Omens is also going to be available as of the 5th Feb 2019. Wording on various stores have it down as a paperback with the description saying its a "Keepsake Hardback edition". Your guess is as good as mine as to which it is. THE QUITE NICE AND FAIRLY ACCURATE GOOD OMENS SCRIPT BOOK will be released on the 4th April 2019. Paul will be signing at Fordingbridge Library on the evening of the town annual Christmas Lights Switch On. Copies of the new publication Terry Pratchett HisWorld, the Complete Exhibition Companion will be available, along with other publications and a selection of Discworld & Charmed Realm prints and cards. Books will be available to buy, or you can bring your own pre-purchased copies. Jason writes: Spenser is now selling his collection over at the Discworld Collector's Guild group on Facebook. This month's issue is brought to you by the nut cruncher, the pastinator and a cup of coffee. 2.5 Troll Bridge - IT'S STILL FINISHED !! !